Chip wrote: Great pieces Herbmaster, Victoria, Britt, Cory and IPT! Now something new ... and Hawaiian. 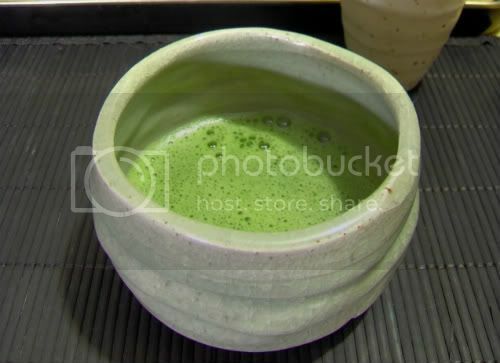 Cory Lum Celadon Chawan as it should be, with Matcha. A gift included with the Chawan ... a "chip-wan" off the old block. I cannot capture the effect with this P&S. But I think the Borneol effect mentioned and displayed by Herbmaster is what was what Cory was after. There is a layering and depth to the glaze. Green Apple Celadon Bottle, just for fun and for contrast. 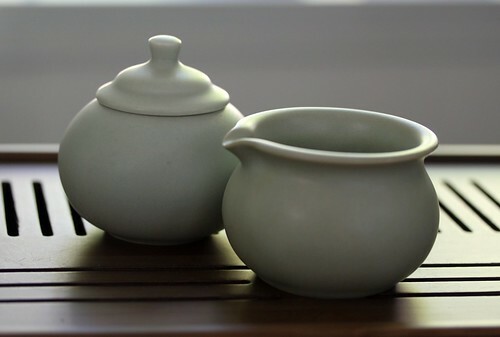 The stoneware clay is covered with porcelain slip which brightens the celadon considerably. The detail image shows the crazing well, which is actually a bad clay/glaze "fit" and considered a flaw. Nice pieces Chip and Shy Rabbit! Thank you very much. I am lucky enough to know him and buy pieces directly from him. Here's a couple of unique pieces of his. 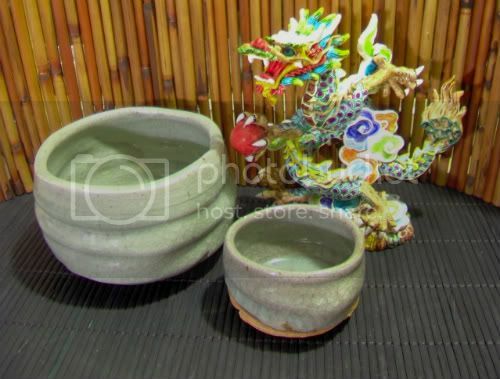 The first one is a waste water container for brewing tea, the second one is for rinsing paint brushes for Chinese painting, and the third is for applying controlled amounts of water to an inkstone when grinding ink for Chinese painting. The Shuizu was made specially for me. I was complaining that I could never find one that was really beautiful, so he made it for me. These glazes are absolutely incredible, but I don't have the ability to capture them with my camera. 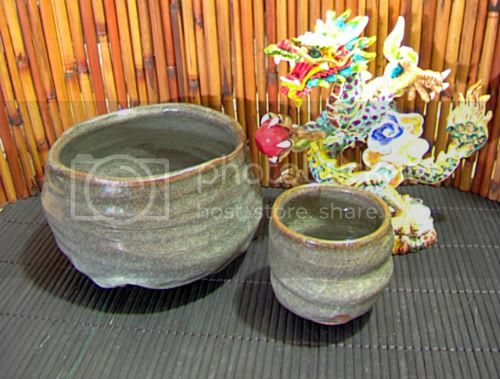 All three have crackles in their glazes. I have used them all of course, but am very careful to wipe them clean. I'm not sure if I want to darken the crackles yet. What do you think out there in TeaChatLand? I have a lot more pieces, but most of them are boxed up and I lack the energy to dig them out. Maybe I'll show more at a later date. Oh, the Shuizhu is quite small. It looks large in the photo, but it is only about 7.5cm (3inches) in diameter. Wow, nice! You are indeed lucky! I have been bugging Hou De to get more in. And I was quite devastated to find a piece I wanted was sold out. These are all so beautiful! I wish I had something like it! Thank you Woozl, Victoria, and Tea4Todd. I am pretty lucky. The best part is, he's actually a very nice guy. Maybe you all can help me with my first post? What are your thoughts everyone? The first piece is particularly beautiful. And yes it has a "presence" that belies its dimutive scale. Gorgeous pieces IPT. And Victoria, the shot of the your pieces together is just stunning. 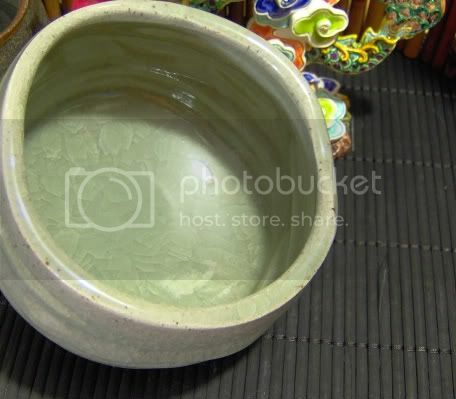 A belated thank you IPT and Victoria for sharing your celadon. And now the dark celadon cousins of the light celadon I showed earlier ... by Cory Lum. The crackling has red deep in the veins. Striking. Happy combination of shape (rounded waves) and glaze (crackly irregular linear bits).